Do you snore at night and your partner complains about it? Are you sick to death of snoring of your partner? Snore Stopper can be the right solution for you. This application is not only trying to stop the snoring but also creates the graph of noise in room during the night, takes the total time of snoring down and many more. Snoring detection is based on artificial intelligence (A.I.) with the support of a new Apple machine learning technology. By using a large number of snoring samples, we can achieve high accuracy in statistics and in snoring detection itself. How it works: Mobile microphone is used to monitor the noise in surroundings. 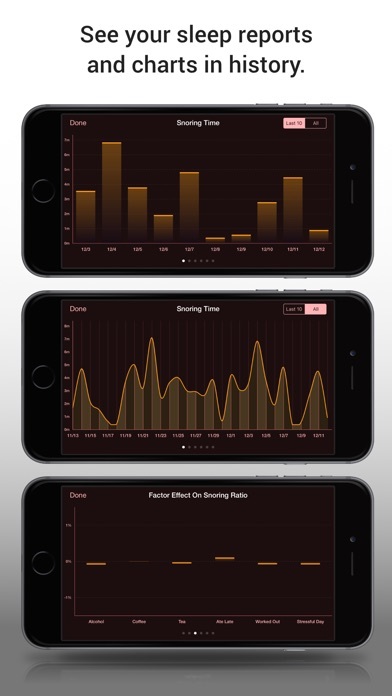 By using intelligent noise analysis the application detects the snoring, makes the statistics or else activates the stop snoring function (at least two snorings one after another) - it quiets you down using a sound or vibration (only iPhone). How to place your device correctly is shown in instructions or screenshots. 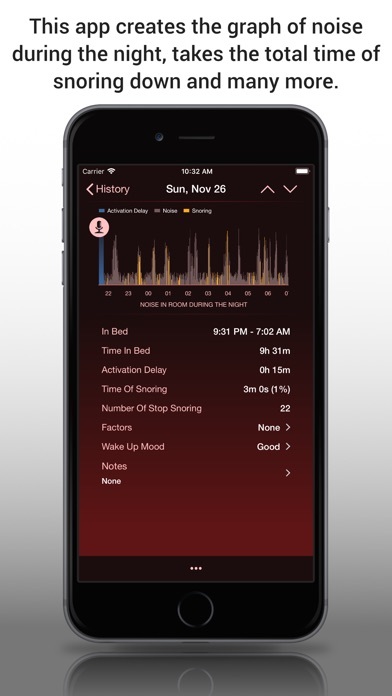 By using the tracker data and by defining your own factors (activities/means/drugs/custom notes) it is possible to find out which facts influence your sleep positively and limit your snoring. At your disposal there are beautiful statistic charts for simple and efficient analyzing of your sleeps/nights. 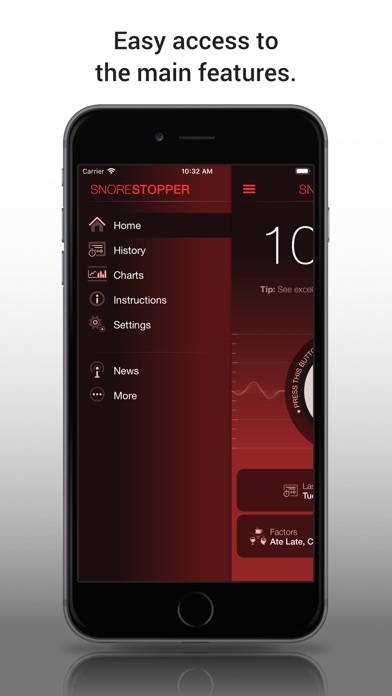 HIGHLIGHTS: - SNORE ANALYZER (TRACKER): Sleep cycle analyzes and statistics with complete history and beautiful charts. - HIGH TECH SNORING DETECTION: Accurate snoring detection based on A.I. 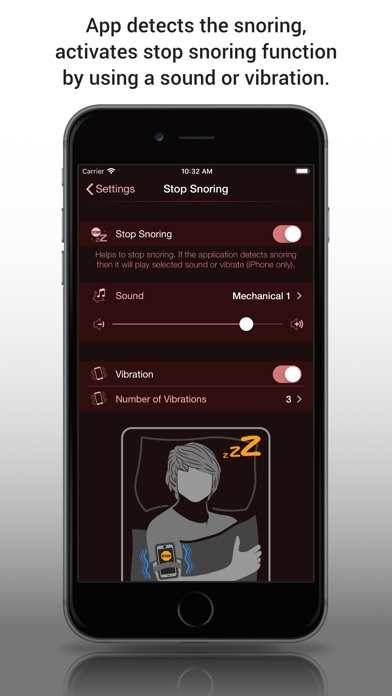 - STOP SNORING: Possibility of playing chosen sound or using iPhone vibration when the snoring is detected. - FACTORS, WAKE UP MOOD, NOTES: User can place factors (alcohol, coffee, stress etc.) to every night as well as the mood after waking up or users own notes. - ACTIVATION DELAY: Start monitoring after a period of time. - BACKGROUND MODE: Monitoring runs also in background mode. - APPLE HEALTH INTEGRATION - iCLOUD SYNCHRONIZATION: Synchronization among your devices (optionally). - EXPORTING HISTORY TO CSV FILE PLEASE NOTE THE FOLLOWING: * It is recommended to connect your iPhone (iPad) to a charger. * Set "Airplane Mode" or "Do Not Disturb" on your iPhone (iPad) for undisturbed sleep. * Place your iPhone (iPad) according to the instructions (see screenshots). CUSTOMER SUPPORT Happy customers are our highest priority. 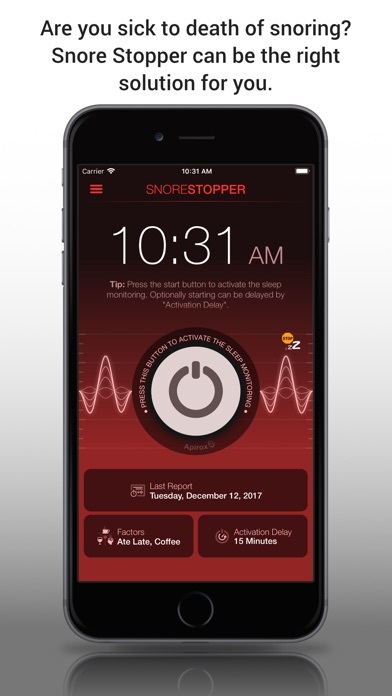 If you have a problem with our app, please contact us at stopsnoring@apirox.com. Thought this would be really great. Have vibrate set and sounds set. No sound I make will trigger alert. I see the amplitude wave increase but it fails to trigger sound or vibrate. Waste of money. Not sure what good this does? How does it alert you? I tested it out and it did not alert me with any sound or vibration. No setting for vibration or sound either. Not sure about this app unless I'm. Doing something wrong. Seems like it is working….Down to 1 to 2 minutes per night…. Work nicely. Now I know I snore sometime, but not sure what to do about that.